$379.99 & FREE Shipping on orders over $59 $35. as fast as multi-bottle fillers and easy to use! my daughter bought a wine bar and the former owner uses this bottle filler. I'm buying this as a backup for my daughter. I have used this wine bottle filler for 5 years and the pump finally gave out. I bought a replacement unit and repair the old one as a back up. To make my bottle filling faster and more automated! Because I'm tired of losing wine to cheaper bottle fillers and requiring assistance in bottling. I found this item on Amazon and put it in my cart. The next day Amazon had raised the price by $200 (making it nearly 600!) I searched for another seller and was happy to buy it. It will replace a buon vino jet filler currently in my winemaking classes to be used for bottling 120 bottles every other week or so. Everyone says this is the best for small wineries and you have the best price around! We have two, and they work well. I watched online videos to help me decide. I have seen this machine during the exibition and it was good. Does this filter out sediment? BEST ANSWER: From what I understand you can get an in-line filter attachment to go with it however it does not come with it. If you are referring to sediment on the bottom of the vessel you are drawing from, you can adjust the end tube to keep it from sucking up sediment on the bottom. This does not filter out sediment but the pump is plenty strong enough to pull through an inline filter you place between your product and the bottle filler. No it does not, you need to get an additional filter housing and your choice of filter sizes, available from the same placeEnter an answer to this question. 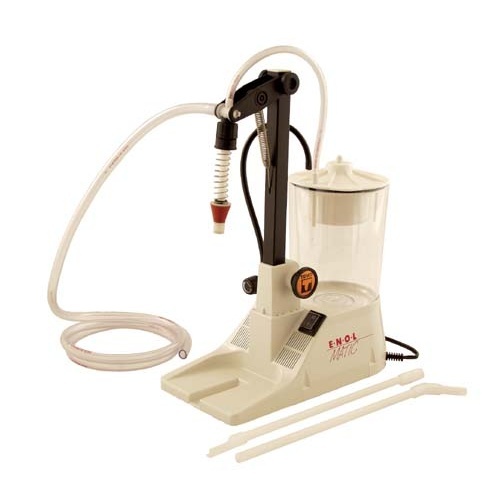 I use this product for bottling my wine and in that regard it works very well. This does not filter the wine or remove sediment. No, you need to filter the wine before you fill. What looks like a filter is really a reservoir to catch overflow. Hi. No it does NOT Filter out sediment. But it works Great ! Good luck. No. It has no built-in filter. That is an addition. great product.. quick, clean, efficient. works great i Just bottled 156 bottles . This devise really speed up our bottling time by 2X. About 24 seconds per bottle. Is you are consistent with how you load and unload the bottle, the precision fills are very consistent. We only had to adjust two out of 300 bottles. We ran it continuously for about 2.5 hours, bottled direct from the barrel. So simple. I’m very satisfied. A great value.